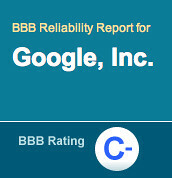 Mike noticed yesterday that Google had a BBB rating (Better Business Bureau) of a C-. 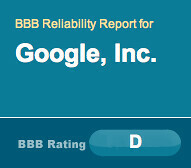 They do, but what most people don't know is that over a year ago, Google had a D score from the BBB. So Google is actually improving. So I for one will give Google kudos for getting that grade up, it is progress for the human-less Google.